Drop by the Guild Gallery over the Open Studio Weekend on October 13 and 14 and chances are you’ll find one of our artists at work. See silver jewelry being crafted, learn the finer points of painting in gouache and watercolor, or dive deep into the stained glass process. You’ll meet some very creative Vermonters and get an inside look at how they craft the original works shown in our gallery. Free and open to all. 11am & 2pm: Ashley Wolff – Floral, landscape and abstract paintings in gouache and watercolor. 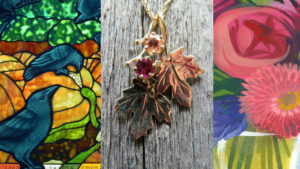 12pm & 3pm: Hallie Monroe – Traditional and modern stained glass techniques. 1pm: Joan Drew – Watercolor landscapes and florals. Joan will be demonstrating at her Brandon studio, 29 Union St.
11am & 2:30pm: Wenda Curtis – Handcrafted autumn-themed jewelry in silver and semi-precious stones. 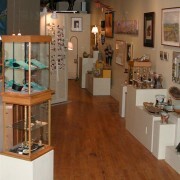 1pm: Jill Listzwan – Whimsical adornments using colorful polyresin, crystals and beads. Hallie Monroe – Traditional and modern stained glass techniques.